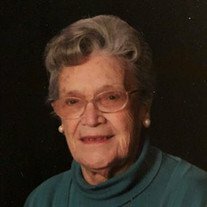 Bernice "Nikki" Armstrong, 93, of Madisonville, KY passed away Tuesday, February 5, 2019 at Madisonville Health and Rehab. She was born February 19, 1925 in Narrows, KY to the late Cyrus W. Sharp and Verna Renfrow Sharp. She was also preceded in death by her husband, James L. "Jim" Armstrong; one daughter, Debra Armstrong; five brothers, and six sisters. A lifelong Kentucky resident, graduated from Daviess County High School, Nikki and Jim moved to Madisonville in 1956. They were members of First United Methodist, where she was a member of the Opal Audas Sunday School for over 60 years. Nikki worked as RSVP coordinator for Pennyrile Allied Community Services and also worked for Welcome Wagon and volunteered at the Housing Authority. She was also a 48 year cancer survivor. She was an avid reader and Friend of the Library. She enjoyed travel and loved her church and community and spending time with family and friends. She is survived by two daughters, Karen (Allen) Oldham of Brentwood, TN and Laura Armstrong of Madisonville; two sons, James L. Armstrong Jr., of Madisonville and Dwight (Cynthia) Armstrong of Brentwood; four grandchildren, Alison Oldham (Ben) Boeving, Russell Allen (Kristen) Oldham, J.R. (Rachel) Armstrong, and Jessica Armstrong; seven great grandchildren; and many nieces and nephews. Funeral services will be 11:00 A.M. Friday, February 8, 2019 at First United Methodist Church of Madisonville, KY with Rev. Ken Hundley officiating. Burial will follow in Rosehill Cemetery in Owensboro at 2:30 P.M.
Visitation will be from 4:00 P.M. until 7:00 P.M. Thursday at the funeral home and from 10:00 A.M. until service time on Friday at the church. Memorial contributions may be made to the First United Methodist Church or the American Cancer Society. Envelopes will be made available at the funeral home.